Until earlier this October, the only time I had visited Ireland was in April of 1989, on the World B. Tour. A group of American former collegiate basketball players came to the Emerald Isle on a hoops tour, taking part in an international tournament outside Dublin and playing exhibition games against Irish all-stars and holding school clinics around the country. It was a grand time that I wrote about for Sports Illustrated. Not surprisingly, I was paying attention to basketball, new friends, and Guinness, and not the business scene—but as I discovered on my return trip, the tour took place when Dermot Clohessy was still a pretty junior employee at IDA Ireland, the semi-state organization that promotes foreign direct investment into the country. In 1989, says Clohessy, who’s now IDA’s executive director, the leading foreign employer in Ireland was Fruit of the Loom, which had taken advantage of low labor costs to establish large manufacturing operations. But that year, Intel announced its decision to establish a high-tech chip manufacturing presence in Ireland. Some tech companies were already in the country. But Clohessy calls Intel’s arrival a “watershed” moment for Ireland—kicking off a new era of technology investment that in many ways signaled the nation’s emergence into the global high-tech economy. As I toured the country again this month, only this time with an eye to the business and technology landscape, it was plain to see that Ireland is in the midst of another defining moment in its innovation evolution. This country of about 4.5 million is moving up the innovation chain. A place that made its mark in international business as a low-cost labor and manufacturing center for multinational corporations, then became home to their tech-driven European sales and customer service operations, now is out to add another dimension—as a key place to create new products and services, perform advanced R&D, and do basic science in select fields. It isn’t just about the big guys, either. A small but increasingly vibrant startup scene is emerging in Ireland as well. Many startups have formed to provide various services for the multinationals. But a new culture of entrepreneurship is spawning a a different (and more diverse) generation of homegrown companies. Meanwhile, Ireland is upping the ante on its own innovation infrastructure and research system. Earlier this month, Science Foundation Ireland, the equivalent of the U.S. National Science Foundation, announced five new national research centers—funded by 155 million euros from the Irish government and 90 million euros in cash and in-kind services from industry—to go with the seven the country already had. To provide a better understanding of this transformation—and the challenges Ireland still faces in its high-tech evolution—Xconomy is announcing today a special report on Innovation in Ireland. Over the past month, four editors have visited the country, backed up by others who stayed in the U.S., with the aim of generating a highly concentrated version of the in-depth, editorially independent, coverage we provide every day in the 10 U.S. clusters we call home. We spent time at multinationals, startups and incubators, universities, R&D labs, and national research centers—across many sectors, from life sciences to information technology, drugs to medical devices, hardware to software. In addition to the Dublin area, the team visited Galway (a thriving medtech cluster with a growing tech startup scene); Cork (home to Apple’s European headquarters, virtually all the big names in Pharma, and world-class science and technology at University College Cork and the adjoining Tyndall National Institute); and Limerick (the University of Limerick is lead institution for two national research centers—SSPC, the Synthesis and Solid State Pharmaceutical Centre, and Lero, the Irish Software Research Centre). What follows are some 20 stories showing what we have turned up. These stories were produced independent of our sponsors, following Xconomy’s ethics policies, like everything we do, with an eye toward finding what is working and where the shortcomings lie. We will publish these articles in three waves, with roughly one-third appearing today, another third tomorrow, and the rest on Monday, November 3. All will run across the Xconomy network and can also be accessed through our Innovation in Ireland home page and micro site. We don’t pretend to be able to capture a country’s innovation scene in one fell swoop. But we believe the report is the most comprehensive and up-to-date view our American—and global—readers will have gotten on what is happening in Ireland. For instance, the country’s well-publicized, and sometimes controversial, tax policies are just one piece of this story. There’s no doubt that super low tax rates—including the so-called “Double Irish” policy that drew so much international fire the government announced earlier this month it will be phased out—have helped attract a host of multinational tech companies. These run from “older” stalwarts like Intel, Apple, Microsoft, Boston Scientific, Novartis, and Janssen to newer big names like Google, Facebook, and PayPal—and an even fresher wave of tech gazelles such as Twitter, Dropbox, Zendesk, and HubSpot. But as I heard time and time again, from leaders like Louise Phelan, VP of Global Operations for PayPal Europe Services and president of the American Chamber of Commerce in Ireland, tax considerations are often outweighed by a host of other factors. These include stability and consistency of government; access to European Union, Middle East, and African markets; speedy visas for foreigners moving to the country; strong contract and intellectual property laws; a well-educated and loyal workforce; affordable cost of living compared to other parts of Europe; and an increasingly multicultural society where people from other countries feel comfortable (and can find great food and drink as well). All this has contributed to a new attitude in Ireland, much of it centered on moving up the innovation value chain. 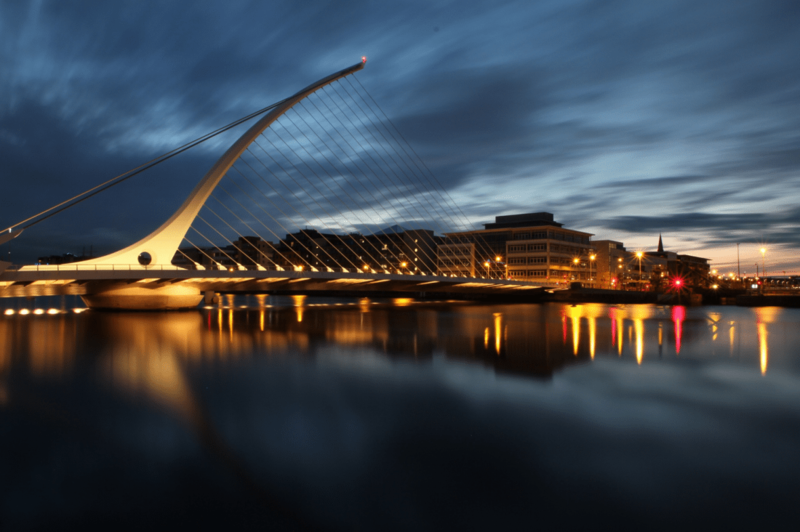 Earlier this October, Dell announced a new Commerce Services R&D Center in Dublin. Intel is teaming up with Dublin officials for a smart cities pilot project that will blanket the city in sensors using the chipmaker’s low-power Quark technology. IBM, which has R&D operations in Dublin, Cork, and Galway, is also working on a smart cities project. Dublin has just appointed its first Startup Commissioner. Even vaunted Trinity College is stepping up its intellectual property licensing and spinoff efforts. But perhaps nowhere will the country’s innovative attitude be more evident than when Dublin plays host next week to the star-laden Web Summit. But ours is not a research or policy report. It is a series of narratives from the street level, the industry perspective, the global view. We have tried to explore these issues, and more, through the voices and experiences of the innovators, executives, entrepreneurs, investors, and government officials who are on the front lines trying to make things happen. Baker Tilly Ryan Glennon; Bank of Ireland; Holmes O’Malley Sexton; IDA Ireland; Science Foundation Ireland; SSPC (the Synthesis and Solid State Pharmaceutical Centre); Ulster Bank; University College Cork.